I tried it out with my students at our Piano Party last Saturday, and it was a hit. The BANG! cards add an element of fun to an otherwise ordinary flashcard drill. Gameplay: Each student draws a card from the box on their turn. If they answer the card correctly, they get to the keep the card. If they draw a BANG! card, they must return all their cards to the box. The student with the most cards at the end is the winner. For the cards, I used the same set of rhythm cards that I used at my camps last summer (the pdf download is available here in my ColorInMyPiano shop, if you are interested). I printed my Level 1 cards so that one side has the rhythms with eighth notes, and the other side does not — which was perfect, because I was working with a group of students that were beginners through late elementary. I told the older students to clap the side with the eighth notes. That’s it! Now you are ready to play. This game is best for groups of 4-6 students. If you have a larger group of students, I would suggest splitting the students into two groups to prevent students from having to wait too long between turns. Thanks for posting this. I printed a Faber Primer level version posted by D’net on Layton Music.com a few years ago, but when I was organizing my games, I couldn’t remember instructions for play. Hi Joy! I had just pulled out a box to make the very same game when I saw your post! Thank you or saving me the work!! Love Pinterest! Just loved this idea and wanted to use it for our Christmas group lesson. So, I found a small picture of The Grinch and made some Grinch cards instead of Bang to add to the hats. I cut them out the same size as the flash cards and before I laminated them, I put a number 1-4 on the Grinch’s chest. If the player got Grinched, he had to put back the number of cards Mr. Grinch requested. This made the game go much faster. We also left the Grinch cards out once they had been drawn to make the game go quickly. I am planning to make a Bang box just as soon as the current box of tissues is empty! They last a lot longer when I am not teaching. Thank you for maintaining this amazing site! I love the Grinch idea — how fun!! Thanks for sharing, Whitney! Thanks for posting this! Im a MUED student at Bowling Green State and Im the music director for a camp this year for K-12, so this is going to be really helpful for the workshops! Shouldn’t the size of the Rhythm Cards match the size of the Bang! cards? If so, what size(s) of Rhythm Cards match the size of the Bang! cards: the Jumbo set(s) 1 or 2, and/or the Regular set(s) 1, 2, and/or 3? The BANG! cards match the size of the regular sets 1, 2, and 3 — not the Jumbo cards. Thanks for asking! I’m a cello teacher, and my students love the games we do from your website. This game is a favorite of my students! One of my creative students came up with another idea called “Big Bang!” If you get a “Big Bang” card, you can select 2 people to lose three cards. I guess it is a little like UNO in that regard. Thank you for sharing these wonderful ideas! I absolutely LOVE that twist on the game! I can’t wait to try that next time. Thanks so much for sharing, Marla. What do you mean when you say they “answer the card”? Do they just read out the rhythm to their group? Do you check to make sure they are correct or does the group self-evaluate? Joy- how do you know when the game is over? Do you just time it and stop at a certain point? Or do you play until all of the cards are gone? Hi! I love this idea and think I will use it in my middles school class piano. 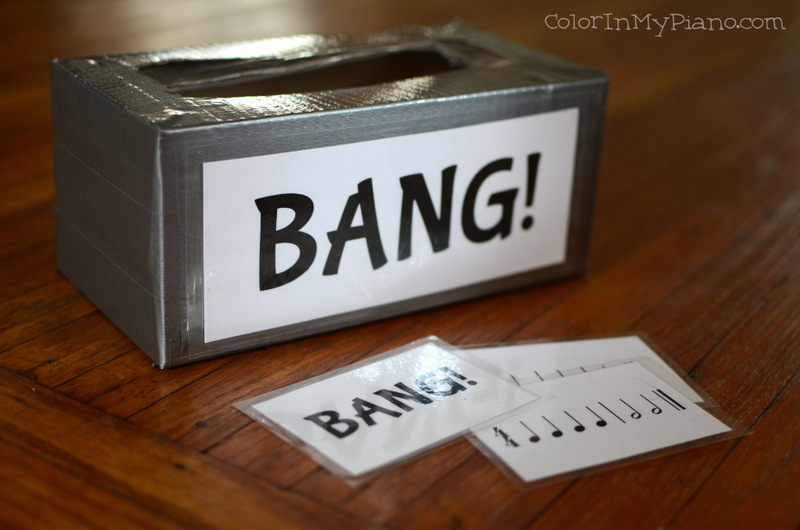 What is the ratio of “Bang!” cards to rhythm cards?